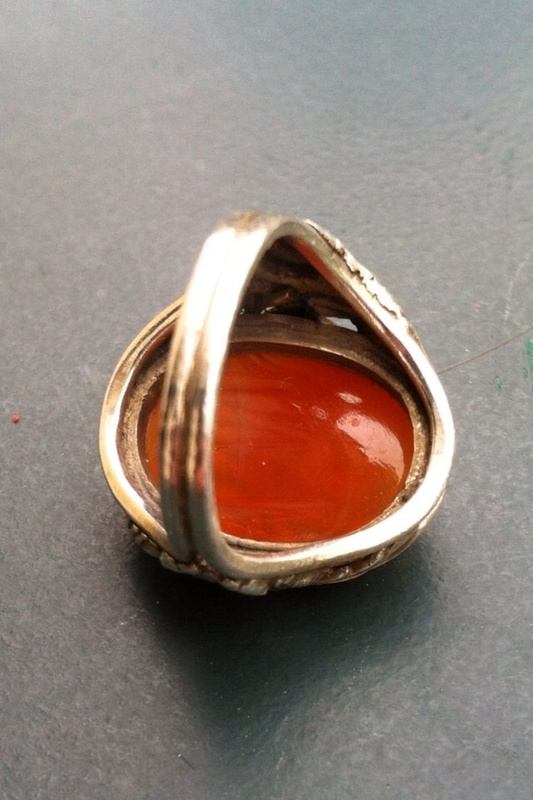 Hand wrought silver carnelian ring, double shank. In Fine Jewelry > Arts and Crafts Jewelry > Show & Tell and Fine Jewelry > Rings > Show & Tell. Lovely daisies and leaves on both sides, would you called it an Arts and crafts piece? My third ring of this kind, with chinese old carnelian pieces, mounted in silver with detailed decor and double shank. 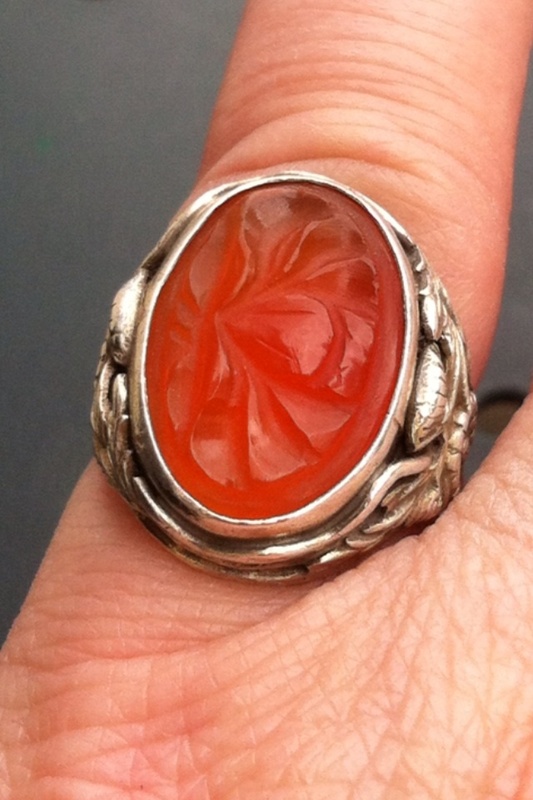 You can say the carved carnelian is old from beeing domed and carved under too. Hi beautiful! Just popping in to say hi! Thanks for your love too ! Wow! I can't help, but what a gorgeous ring! 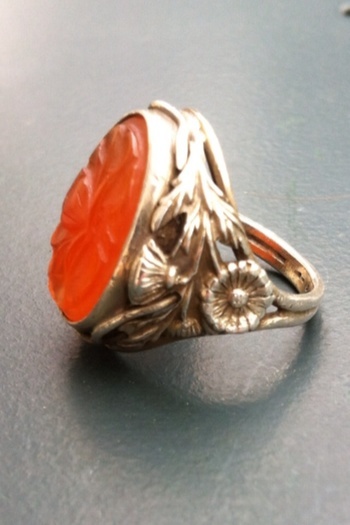 I have one similar but it has a green jade I believe. The ring itself is in terrible condition and it does have Chinese hallmarks. I believe it depicts a peacock. Just beautiful but worth not much of nothing with the setting it is in now. I get an Egyptian revival vibe, 1920s? Really pretty!! 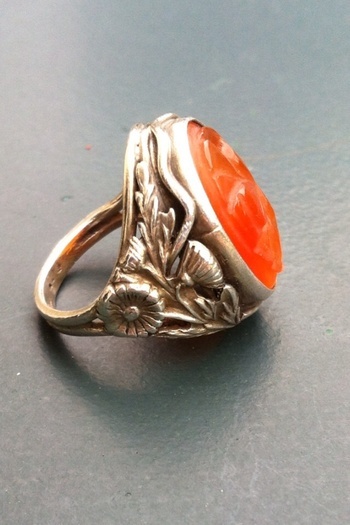 Thank you Stwillia for your visit, BelleEpoque, though the flowers on the shank are daisies, the lotus carving on the carnelian could tell the story! I love this ring, what a beauty!! Sorry for the very late thanks, Elisabethan! Ok, well I don't know but it's the flowers that caught my eye. Just learning about this style and area. The leaves are different but...maybe in his other designs?? ?